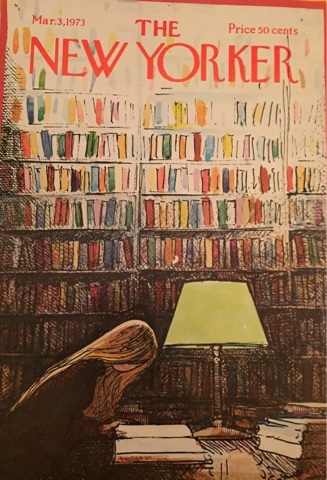 When I was a teenager it always seemed having a subscription to The New Yorker was such an adult thing to do. I only read The New Yorker (which my sister gives me as a gift) at the gym, where a few of the in-depth articles keep my mind off my walking uphill. But I have let them pile up unread of late, because I haven't been on the treadmill. Much of the poetry I don't get. :<) And the same with a few cartoons. I love the long articles when they are on a subject that interests me. The one about France by George Packer recently was excellent, as is the current issue's one on Iceland rescues. These pieces are my food and water. I read them with my breakfast every day.